~ Because I have Seoul in my soul. Yesterday, I did a post about why I want to move to Korea. Today, I’ll be more specific about my desired location. While Busan (부산) would be great since it averages 6 days of snow per year, and Suwon (수원) would be a cheaper alternative, Seoul (서울 특별 시) is my destination of choice. The obvious reason would be that I have more friends in Seoul, and probably more chances of getting a good job in Seoul. But many do not like Seoul due to the high population, bad traffic and extra pollution. So of all the places in Korea, why would I pick Seoul to move to? Here are a few reasons why this is my first choice of where to live in Korea. Unlike a lot of people, I don’t mind being in a big city. The thought of living in Seoul does not intimidate me at all. I don’t fear being a victim of crime when walking around Seoul. I don’t have worries about my health as I felt healthier in Seoul than I did in the U.S. While Seoul has many food options, the food is usually healthier than the food in the U.S. Big city lights don’t bother me at all, and there are spots in the Seoul area that are not as light up and noisy at night. You can be in an area where there are a good number of #waygookins, or in a more traditional area with almost all Koreans living in the neighborhood. With the public transportation being one of the best systems in the world, and being very affordable to use, it won’t be necessary for me to have a car in Seoul. Also, using the subway to get around can be faster during rush hour than trying to drive from one part to the Special City to the other. 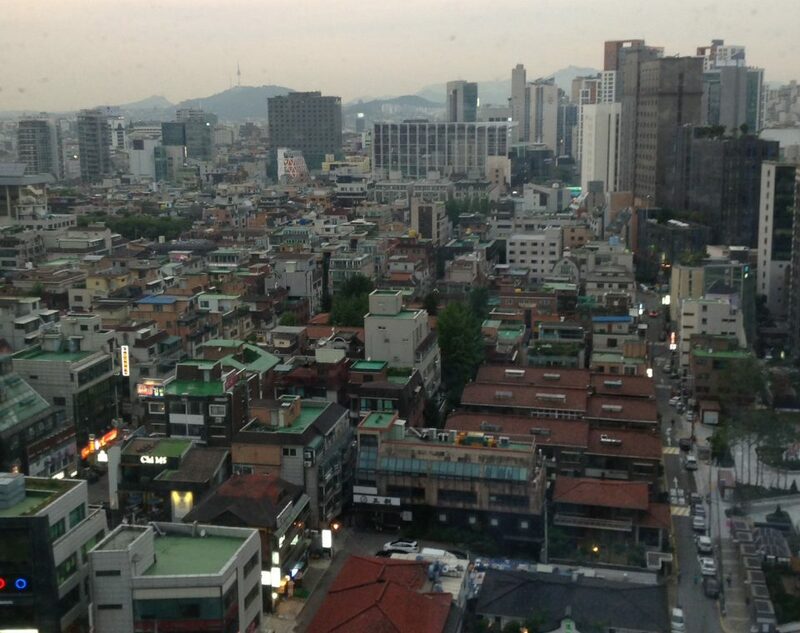 Overall, living in Seoul would make my life easier than living in other areas. If my family came to visit me in Korea, it would be hard for them to do so even in Seoul. From where I live, it would be over 14 hours on a plane to get to Seoul. When I went to Seoul in 2014, my second plane took off from the west coast of the U.S. at 11:00 am on a Tuesday morning. When I landed in Seoul, it was 3:00 pm on Wednesday. While I was able to take small naps on the plane, some people cannot sleep on a plane. This makes the long flight even longer to deal with, with a trip to customs to follow after you get off of the plane. Depending on where I would live in Seoul, it could take another 1-2 hours using public transportation to get to the area where I live. If I lived in Suwon or Busan, it would be an even longer trip. This would physically be too much for my parents to endure to come see me. It would be much easier for everyone if I lived in Seoul if all possible. If I take the amount of time that I spent in Seoul and compare it to the amount of time that I’ve lived, it would not even equal 1% of my life. But my time in Seoul was the happiest I’ve ever been. Was being in Seoul exactly like how life was in Korean dramas? Not by a long shot. Will living in Seoul be easy for me? Not by a long shot. But Seoul seems to fit me like a glove fits a hand. The pace of life, the people, the food the culture all makes me feel at home. I feel more at home in Seoul than I do in the US. The feeling of happiness that Seoul brings me is something money cannot buy. People have different reasons for wanting to go to Korea. Some reasons are good and based on reality, others are not. For some, the countryside is a perfect place for them to learn more Korean and to live their life. For others, the island life of Jeju is a great place to set up business and retire. But for me, the Special City is a special place for me. That is why no matter what disadvantages it has, Seoul is the place I want to be. In search of new meanings.